"Where the views are endless"
Picture perfect sunrises! 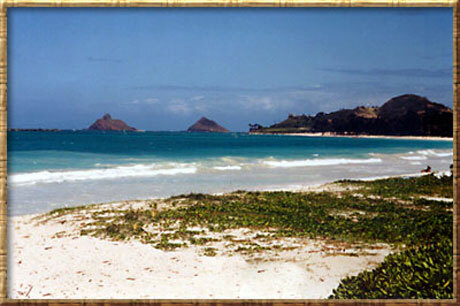 Relax in the tropical yard or stroll on beautiful Kailua Beach. Indulge yourself in this paradise surrounded by beauty. Delight in the sounds of the waves gently rolling in and the sight of the palm trees swaying to the soft breezes from the sparkling Pacific ocean. 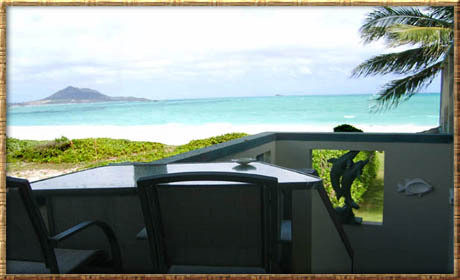 Our lovely studio or 1 bedroom accommodations directly on beautiful Kailua Beach are modern and spacious. They are designed with lots of windows and sliding glass doors to capture the endless ocean views. Ceramic tile and ceiling fans make for a cool and comfortable ambiance. Completely furnished to include ample cooking appliances, rattan style furniture, cable TV, VCR, phone, BBQ, laundry area, private parking and many children's and beach accessories. Unit "I", the beachfront studio, approximately 470 sq feet in size is lovely and modern with beautiful ocean and beach views. 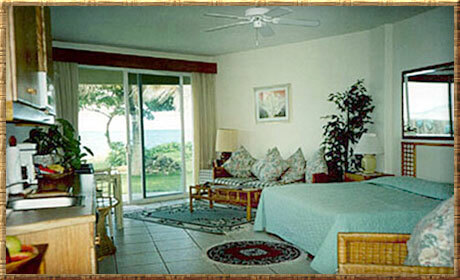 Price $219.00 per night plus 14.96% tax for 2 guests. Unit "J", the one bedroom unit of approximately 600 sq. feet, located in the same beachfront home but with garden view, is spacious and modern. Walk only steps along the house to the beach and blue Pacific ocean or enjoy the large tropical oceanfront yard. Price for 2 guests $199.00 per night plus 14.96% Tax.